RBHS string orchestra plays during the senior processional. 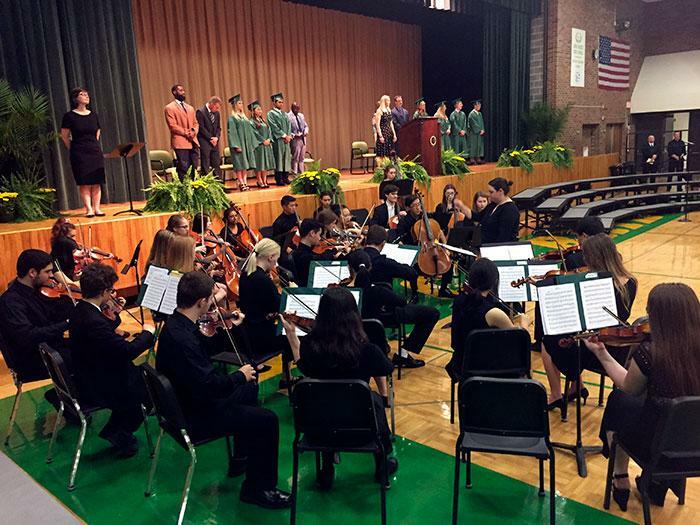 As the sound of the string orchestra swelled, the people in the bleachers rose to their feet and a stream of green entered the gymnasium as the 2018 RBHS senior class attended the long historied ceremony in preparation for graduation in their cap and gown. While baccalaureate originated as a religious ceremony for graduating seniors, here it has evolved into a celebration of the senior class. Principal Dr. Jennifer Rukstad said in accordance to changing traditions and Supreme Court rulings baccalaureates now differ from their original purpose. The speeches throughout the ceremony struck a common theme of commemorating the senior class for their time at RBHS and looking ahead to what’s to come. Class president senior Dalton Nunamaker, one of the speakers, said RBHS has 480 graduating seniors who have received more than eight million hours of public education and have put countless hours into achieving success in everything from athletics to fine arts. The other student speaker, senior Laith Almashharawi, used his speech to offer advice and praise to the approximately 250 seniors in attendance. Special performances by seniors Yoo Jin Jeong, Rosalind Eggener and the concert choir broke up the speeches. The string orchestra played during the senior processional and recessional. Rukstad saw the event as an extra final time for seniors to come together at RBHS and memorialize their experience in the school.